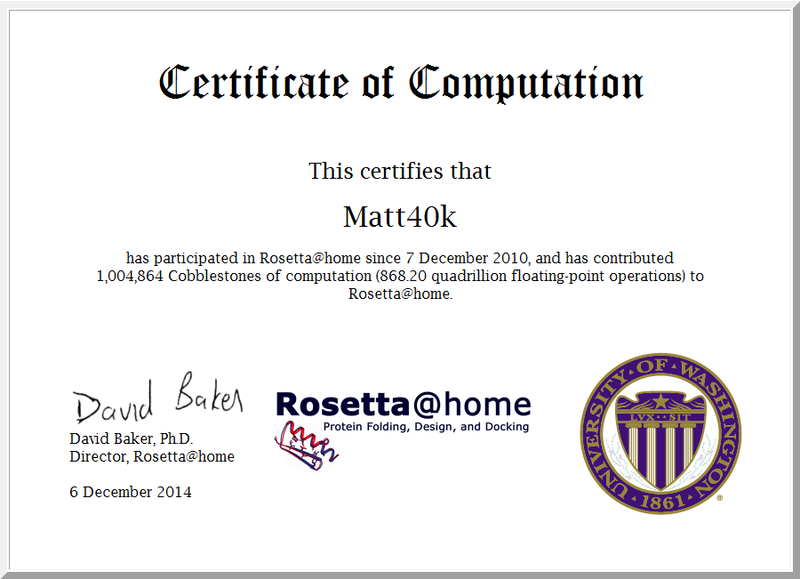 Tomorrow, Sunday the 7th December 2014, I will be celebrating 4 years of contributing wasted CPU cycles to the excellent Rosetta@Home project. Rosetta@home project is determining the 3-dimensional shapes of proteins through research, that may ultimately lead to finding cures for some major human diseases such as HIV, Malaria, Cancer, and Alzheimer’s. The project is lead by Dr David Baker at the Univerity of Washington. You can find out more about the Rosetta@Home project on their website – http://boinc.bakerlab.org/. credits mark. I think in part this is because of my new i5 CPU I got for my birthday this year.